Eternal Haunted Summer: You are an awenydd and a devotee of Gwyn ap Nudd. What goes into being an awenydd, into living as an inspired poet/soothsayer? Lorna Smithers: The path of the awenydd is rooted in Brythonic tradition. In his Description of Wales (1194) Geraldis Cambrensis refers to ‘awenyddion, or people inspired’. Awen means ‘divine inspiration’. It flows from Annwn, ‘the Deep’, the Brythonic Otherworld through all living things. Being an awenydd involves questing the Awen on many levels from the minutiae of insects and plants to the immensities of rivers and mountains, communicating with deities and spirits, working with dreams, journeying to Annwn, and sharing insights within one’s communities. Gwyn ap Nudd, ‘White son of Mist’, is my patron god. As a ruler of Annwn, he taught me to walk between worlds to seek the deeper wisdom of the Brythonic myths. Much of my work focuses on divining how Brythonic mythology underlies and illuminates our current environmental, political, and spiritual crises. EHS: There is a dearth of good material available on Brythonic polytheism. Where would you suggest people start looking, and what are some things of which they should be wary? LS: There is certainly a dearth of good material available! As far as I know, Dun Brython, of whom I’m a member, are the only group actively disseminating information on Brythonic polytheism, although there are a few books on individual deities. I’d suggest visiting our website and blog. I’d also recommend reading the ‘core’ mythological texts: The Mabinogion, The Four Ancient Books of Wales, and The Triads of the Island of Britain, supplemented by works of Celtic scholarship and folk and faerie lore. However, you won’t find the Brythonic deities just by reading books — they need to be experienced directly through ritual, prayer, meditation, journeywork, dreaming, walking the land, or whatever technique works for you. Brythonic polytheism is a religion of devotional relationship and the myths need to be lived by. As there’s so little material out there I don’t know of anything to be wary o f… yet. However, as Brythonic polytheism is rooted in a specific culture, there is a potential for culture to be confused with race and thus for racism. At Dun Brython we’ve been careful to make it clear that Brythonic polytheism is open to people of all backgrounds by issuing a statement on inclusivity. EHS: Congratulations on the publication of The Broken Cauldron! What inspired you to write it, and what can readers expect to find within its pages? LS: It probably began in 2011 when I embarked on a Bardic/Druidic path and found myself incredibly alienated by the centrality of the story of Taliesin and unable to understand why a braggart and sycophantic supporter of bloodthirsty warlords is venerated as the quintessential bard. In 2015, during a conversation with Gwyn about a vision of environmental catastrophe, I found myself transported into the scene where Ceridwen’s cauldron lies shattered and Gwyddno’s lands devastated by poison as a result of Gwion/Taliesin’s theft of the Awen. I realised the broken cauldron was its source. Thus the title was conceived. Within its pages you can expect to find a variety of broken vessels and the legacies of undisputed figures such as Taliesin and Arthur, who break or steal the cauldron, put into question. 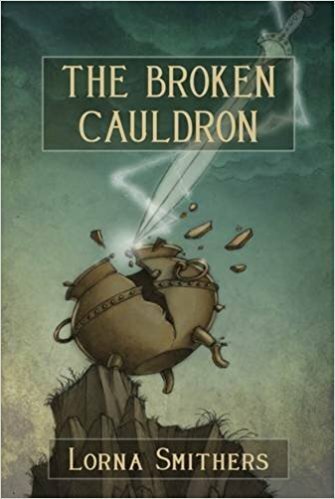 EHS: Where can readers find The Broken Cauldron? LS: It can be purchased via this page on my website. LS: I’m currently working on my third book, Gatherer of Souls, a collection of stories and poems recovering and reimagining Gwyn ap Nudd’s mythos as a psychopomp and god of the dead. I’m going to be co-editing A Beautiful Resistance #4, the next Gods & Radicals journal, with Lia Hunter. I’m also giving occasional talks and running workshops in the pagan community based around Brythonic mythology, folklore, and spirits of place.